The original Johnston Sans had only two weights, a regular and a bold. In time, Kono would design eight new ones — including a lighter face and a bolder lower case. [...] The battle won, Kono found a good way to signal his East Asian input on a London landmark: when he came to present his work for the first time he displayed his various New Johnston fonts with just one word: Underglound. I tried to find more details about this, but was not successful. Garfield's book is popular non-fiction so individual facts aren't cited, and I can't see anything in his bibliography that obviously would be it. However, I did find this PDF of an article by Kōno himself with much more technical detail about what he actually did. (It looks like it might have been a talk he gave at Pen to Printer 2003.) There is a sample "Underglound" image in there, but Kōno doesn't explicitly say how (or even whether) he used it at the time; he just says "Only a Japanese designer can do this!" Today I have only a link: the posters for the upcoming Waseda-Keiō (or Keiō-Waseda!) baseball game, in which real students enact ha ha only ultraserious performances of school rivalry tropes. WASEDA: "Birigyaru"tte kotoba ga o-niai yo, Keiō-san. 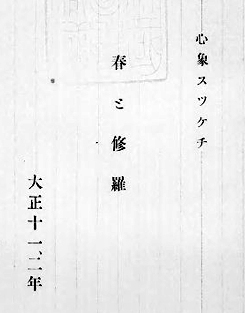 KEIŌ: Hankachi irai patto shinai wa ne, Waseda-san. Weird thing about the typography on these — you're meant to read the left half first and then the right half (a couple of them are more obvious about this than others), but within each half, you read the columns in the traditional order, right to left. Also, interesting lexical fact: this item is at buzz-media.net. There's a similar site called corobuzz.com. Hypothesis: the "buzz" of Buzzfeed is rapidly becoming a morpheme in Japanese signifying "this is a web site that posts fun listicles." Notice anything odd? Right: sukecchi (sketch) is misspelled sukkechi -- a two-character transposition from スケツチ to スツケチ. A bit embarrassing on a title page, but no big deal. Interesting though that the error should be in the katakanafied English loanword. It draws attention to the vigorous heterogeneity of vocabulary on this page alone. Haru is ancestral Japonic, a cornerstone of the nation's poetry since before it was even a nation. Shura 修羅 is ultimately from Sanskrit Asura, via Chinese. Shinshō 心象 is Chinese in that it's made of Sino-Japanese morphemes, but to judge from the citations in the Nikon Nihon Kokugo Daijiten (earliest is 1892) and the extreme paucity of examples in the Chinese Text Project, I strongly suspect it was a Meiji-era Japanese invention. Incidentally, the 1996 animated Miyazawa Kenji biopic Haru to shura was released in English as Spring and chaos . "Chaos" is another possible meaning of shura — the direct referent there is the wartorn Asura Realm — and it might be appropriate for the title of the movie. But I don't think it's appropriate for the poetry collection, because in the title poem Miyazawa unambiguously uses the word to refer to the beings themselves, e.g. Ore wa hitori no shura na no da おれはひとりの修羅なのだ ("I am a [lone] Asura"). Another Ikkyū poem, this one about entitled "Konparuza-sha no uta" 金春座者歌: "Song of a man of the Konparu-za" (most likely Zenchiku). By morning he frolics in China, by evening in India. I'm not sure why 王老 (literally "king elder") refers to Nanquan, but multiple commentaries on this poem agree, so there we are. For real, though, the most notable thing about these lines for my money is the appearance in a Zen poem of an instrument that isn't either a flute or a bell (or both). Thirty-odd li south of [Rongzhou] there are two rocks facing each other, shaped like a frontier pass, thirty paces apart, known popularly as "ogre's gate pass." When the Han "General Who Calms the Waves/Queller of the Deep" Ma Yuan subjugated the Lâm Ấp, he passed this way. The monuments and inscriptions are still there. In days of old, all who went to Jiaozhi did so via this pass. South of it, malaria and illness are rife, and those who depart seldom manage to return. Thus the common saying: "If ten depart through ogre's gate pass, nine will not return." Interestingly that last one was also a rejected Australian Tourism Board slogan. But wait, what actually interested me about this poem was the word 吟杖 ginjō, "sing-staff." I remembered seeing it in another Ikkyū poem (looking it up, it was the line 吟杖青鞋孤枕中: "Sing-staff, straw sandals, sleeping alone..."), but I don't recall encountering it in any other poet's work. The Nihon Kokugo Daijiten charmingly defines it as "a staff that poets use when thinking of poetry while walking," and their earliest citation is... this poem. They do note that there is similar phrasing in a 13th-century poem by Wen Tianxaign, but no direct line of descent is proposed.